Hi everyone! Anita Houston here, and so happy to be here! 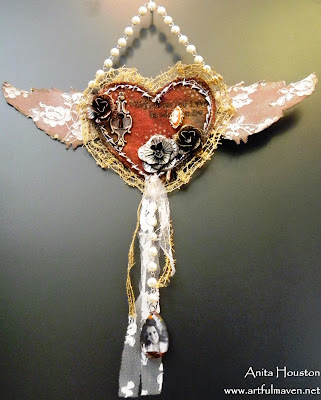 I love the Maya Road Canvas Heart I was given to alter. I knew I had to have lots of metal on it for my rougher side, but also some feminine bits for my softer side. This is what I came up with, and boy did I have a blast making it! 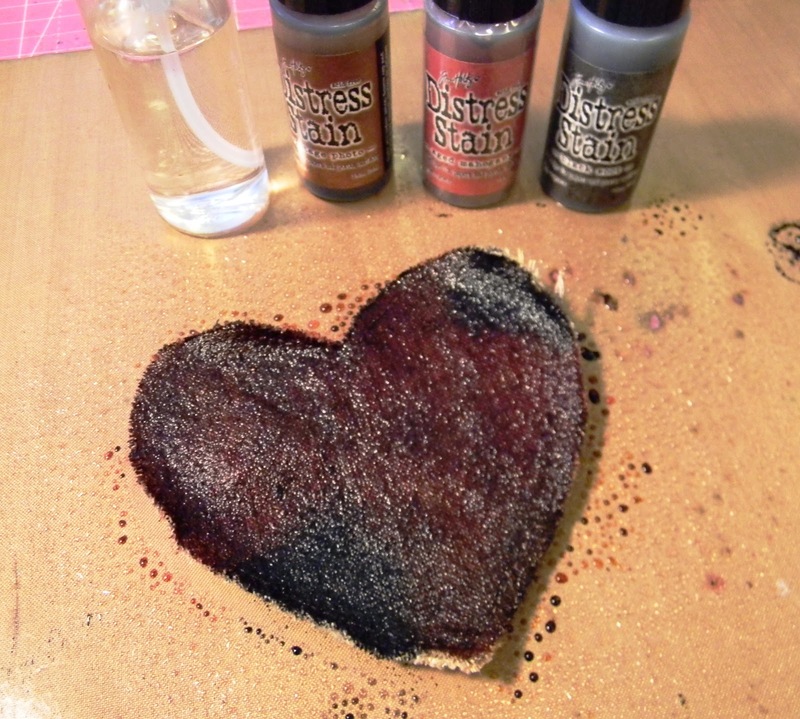 I stained it all up first with Aged Mahogany, Black Soot, and Vintage Photo, with a few mists of water. 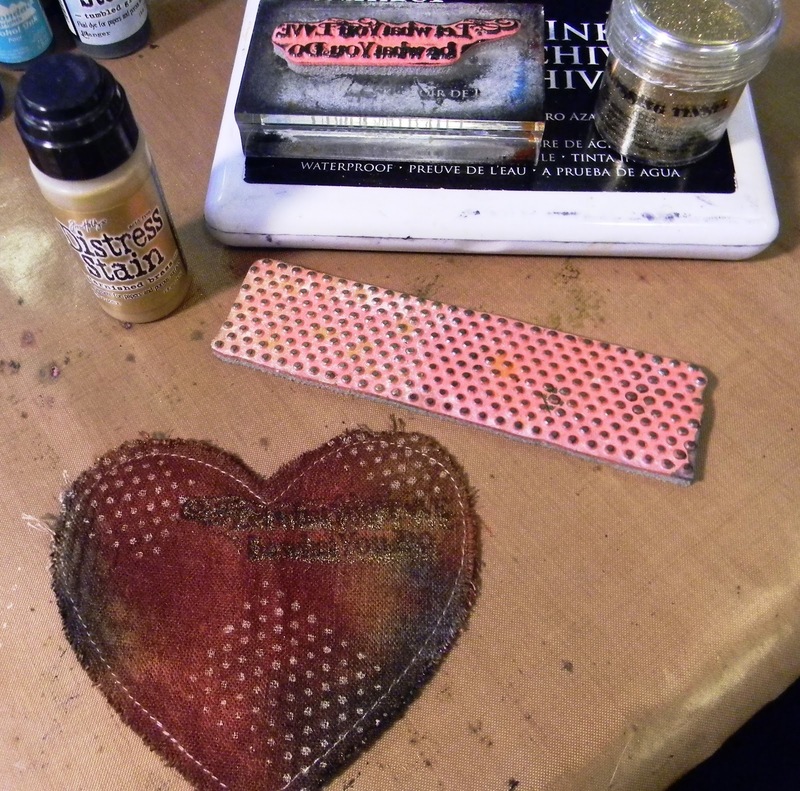 I stamped the dots in Tarnished Brass Metallic Distress Stain. The sentiment was stamped first in Jet Black Archival and heat embossed in Gold Tinsel and then restamped in Jet Black. 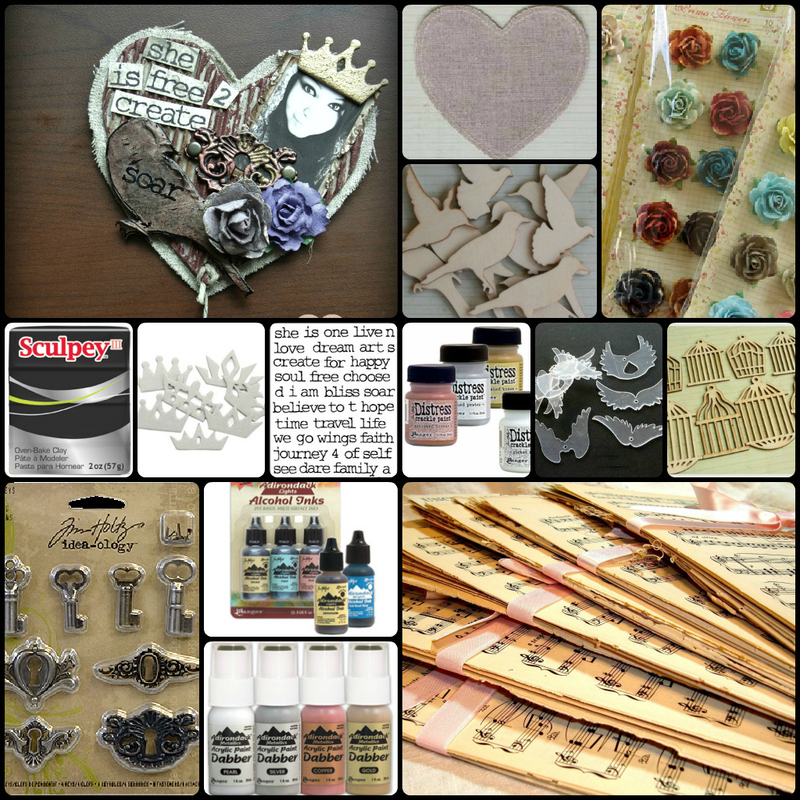 Next came lots and lots of metal, material, and embellishments. It's a little hard to read what it says, as I think I should have let things dry a little better, but it's Wendy's sentiment which I think fits how I feel perfectly, "Let what you LOVE be what you do." I love Art! My very latest "completed" Design Team Project is a decorated Maya Road linen heart. 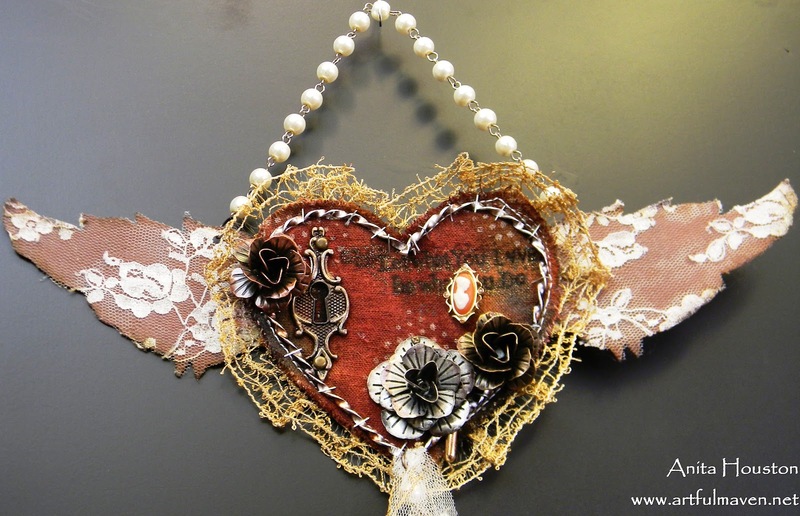 We were each asked to embellish the heart with our own "style". The goal is to describe who we are and what we like to use in our day to day projects. Of course this was a no-brainer for me. I used some of my all time favorite products from Maya Road, Tim Holtz, Ranger, and Prima (product list at end of post). But we'll get into that in just a sec. So why "Uncaged"? Well, it's simple. I have always been a creative person. I can thank my very talented mother for this. She can draw. I cannot. But I did inherit other artistic traits from her. Thanks, mamacita! Back to "uncaged"...well, as most of you know I was in a marriage many years ago that was riddled with domestic abuse. I was not allowed to create anything, to keep journals, to write poetry...nothing. 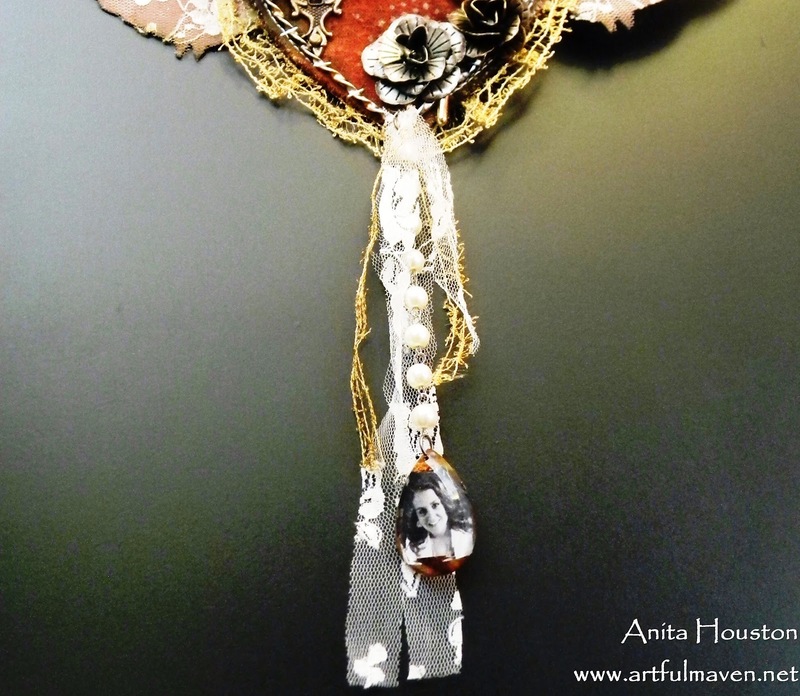 This is devastating to someone like me who needs to express herself with words, with art! I can remember keeping a spiral notebook hidden in the back panel of my nightstand. On the nights that were the most traumatic, I would pull it out after he was asleep and I would write in it...in the dark. I couldn't see lines, but so long as I could feel the paper, well, that was enough for me. That notebook was my only friend for several years. When I visited the notebook, I was free! But any other time, I was a prisoner. ::exhale:: But that is over now! And guess what? I can create whatever the heck I want too! Try and stop me. I use a lot of birds in my work because I wanted so badly to be like a bird. I wanted the courage to fly away, to escape, to break the confines of my cage. Although that time of my life is now over, I still can't fly. Well, at least not physically. But every other part of me has the freedom to soar! Lets work from the bottom up...this wooden cage is by Maya Road. I dabbed it with gold adirondack paint by Ranger. 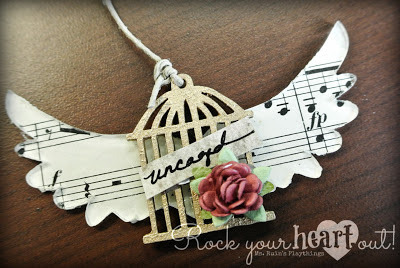 Then I journaled the word "uncaged" on a piece of scrapbook paper and adhered it to the cage. I decided to add a pink flower to soften the idea. The wing is also by Maya Road and it is actually acrylic! I lathered one side of the wing with glossy accents, also by Ranger, and then adhered it directly onto vintage music paper. Once it was dry I simply tore away the excess paper. 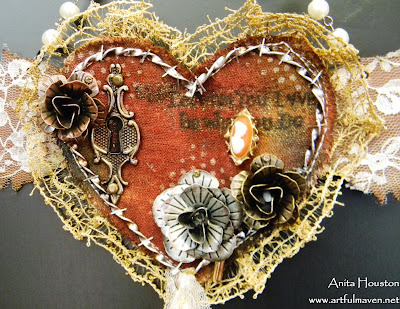 This was easy to do as the paper was very old and brittle. If you are using newer paper you may need to use scissors. 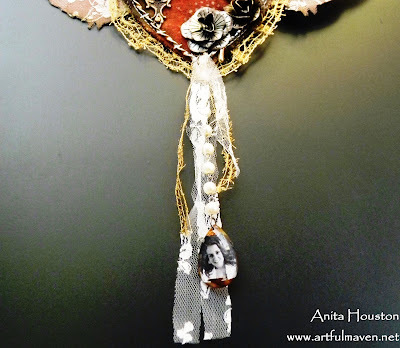 I have been playing with polymer clay lately. I'm new to the clay world but I can only imagine possibilities! I was looking for a bird mold but didn't have any luck in that department. But hey, craft people are resourceful so instead I pressed a Maya Road wooden bird into to the clay and used it as a stencil. I popped him in the oven for 15 minutes --I guess you can say I had a bird in the oven. ;) Anyway, once he was cooled off I dabbed him with various alcohol inks. I don't recall which ones I used, I tried about 4 different shades and finally got this pretty iridescent look. I definitely used Raisin and Gold but after that I don't recall. If you decide to use alcohol ink on clay and you don't have an extra piece of clay but don't want to commit to a color --ink the backside of your project for testing purposes. 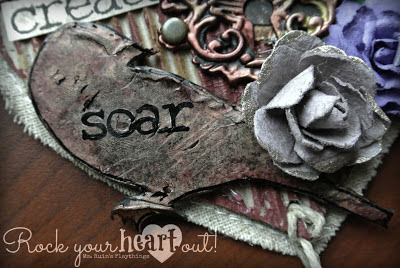 ;) My last steps were stamping the word "soar" and outlining my little fella with a black pen. Oh! Quick note about the "soar" stamp. 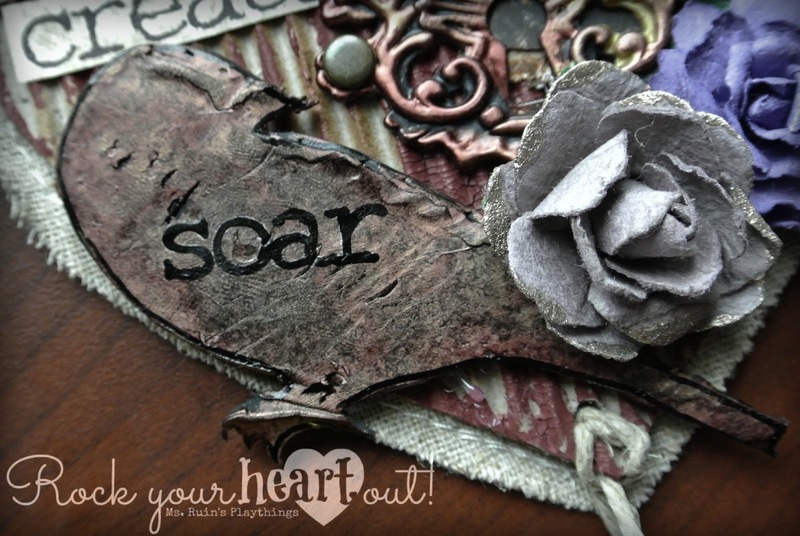 That word, plus the ones I used on the heart are from a new art journaling stamp set by Maya Road. GET.THESE.STAMPS. I promise, you will love them and you will use them often. Another medium I LOVE to use is cardboard. And it's free! 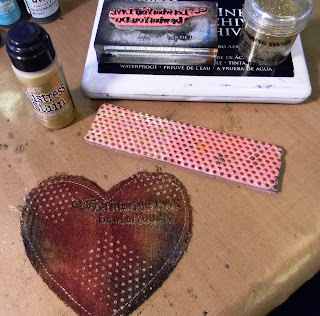 In this piece I cut out a heart from corrugated cardboard and then painted here and there with Mahogony Crackle Paint by Ranger. 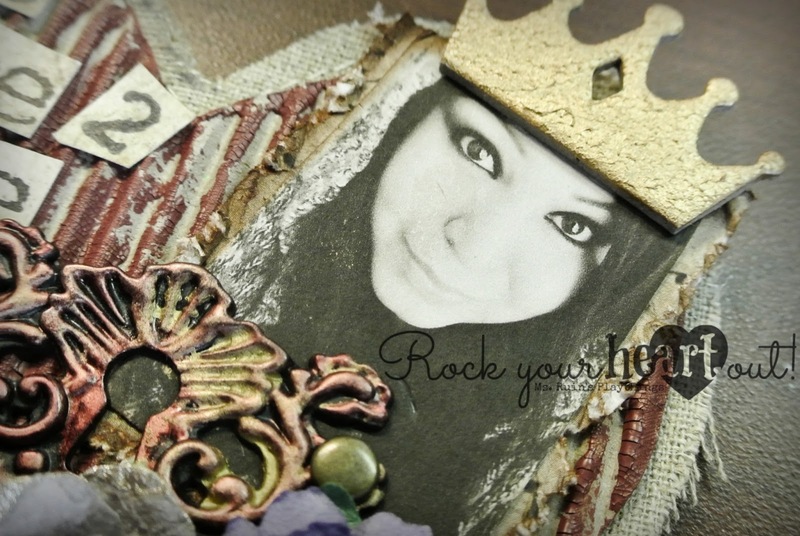 The keyhole is from the Idea-ology line by Tim Holtz. I also used alcohol inks on it. 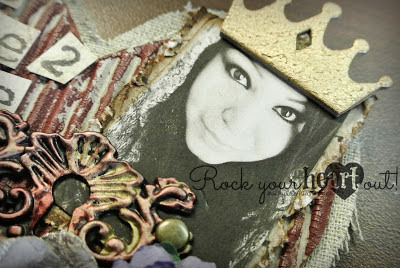 The crown is chipboard by Maya Road, painted with Gold Adirondack Paint by Ranger. So there you have it! I hope you enjoyed my project. I am shipping it off to The Crafty Scrapper today. I almost can't wait to get it back so that I can hang it in my studio. In my next blog post owl feature a couple of fellas that are quite the hoot! You'll have to come back and meet my new friends. ;) I will leave you now with the product list for this project. Peace, love, and taking flight! 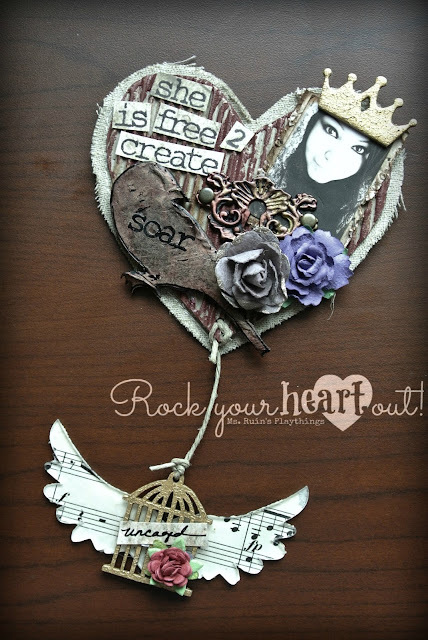 Sonia's heart is gorgeous...love the bird cage dangle! Thanks for having me CS!!! !